In other news my flowers are dead and I feels sad. RIP FLOWERS! I LOVE tartan, you've reminded me I've got some tartan trousers if I can still squish in to them! 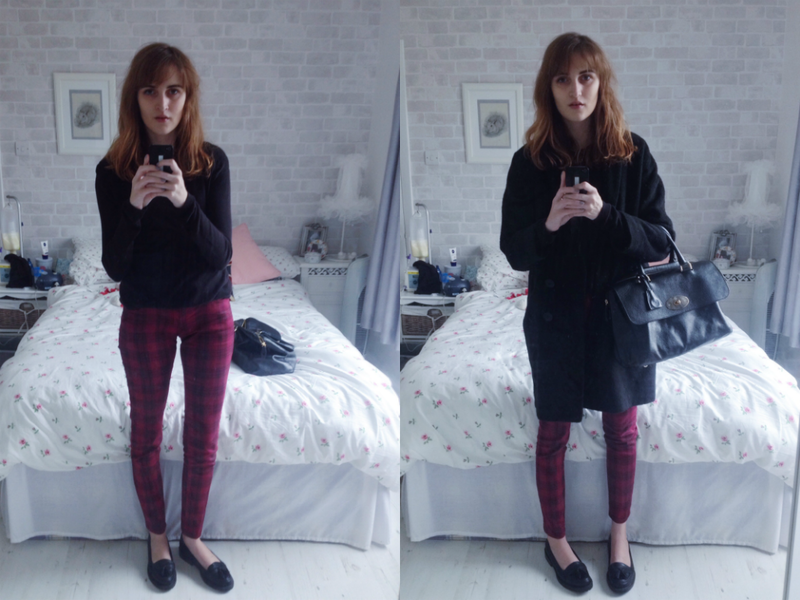 Ooo I love these trousers :) I'm a little obsessed with tartan at the moment as well! "although they made me feel like Gwen Stefani they did not make me look like Gwen Stefani" Um. I died laughing. definitely know what you mean about scene kid days. Had that phase! gorgeous. Love big coats on you! You know, I had tartan pants that I gave away...I regret it now:( Yours are super nice. I do wish my tartan trousers made me look like Gwen Stafani too, doesn't happen over here either but do love them, this pair really suits you lovely, sometimes the random finds are the best! I adore tartan and those are the most amazing pants. Suits you so well. I wish I could pull trousers like this off, I'm loving the tartan! really nice this post !! These tartan trousers were such a great find, and the fit is perfect on you! Thanks for your visit...I am currently away and will be back to blogging on Friday.